Ashton Road in Norton. 1983. Photograph courtesy of Mr Alan Davis, Perth, Western Australia. 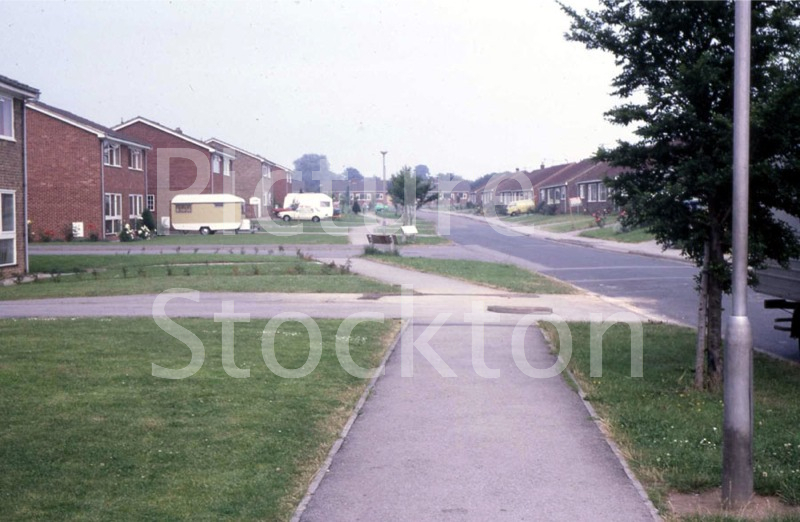 This entry was posted in Misc Roads by Picture Stockton Team. Bookmark the permalink. Would anyone remember my dad Ray Steel who also worked for this company building on the Glebe? I’m doing some research for him as he suffered a brain trauma and his memory isn’t what it should be. I’m just looking for the years he worked for Mr Fordy, he does recall the office on Boathouse Lane however. Taken down the names to see if I can jog his memory a little. My dad Ray Steel worked on the Pug Mill with Jimmy Nelson and Dyker Westwood, thinks that Basnett was the foreman. Also worked on Hills in Norton and the Horse and Jockey. Arty Thomas my dads grandad started with old man Fordy when the business started in the horse and cart days laying drains. Lol King and Brian King were both foremen. Any one have memories of this? Rachel, I worked on the Glebe from 1967 to 1974 and was the site electrician for quite a few of those years. Names you can try with your Dad, Lol Hird the bricklayer and for a while the site foreman, Bob Bashford ran the site office, Ray Galley and Malcolm Fordy ran the company, John Robson the painter, Peter Stockton the plumbing apprentice, Noddy the scaffolder, Tommy Gillies the electrical contractor, Wilf and Wally the joiners, Peter and old Wilf the jobbing carpenters. I am sure if you also name the roads on the site he will remember them, Ashton, Weaverham, Fulthorpe, Kinderton and The Glebe and of course the pub on site was the Centenary. The types of houses and bungalows may stir his memory, The Arran, Afton, Lyric, Katrine. Do you remember John Readhead & a labourer the football celebrity the famous Chris Kamara who both worked on the Glebe site? Yes Anon I remember John Redhead – he had been working in Canada previously I believe. A nice man and always well spoken and professional. I also continue to work in the Construction Industry but not in UK. Left UK in 1983 for Australia, great place for construction workers. Started on the Glebe in 1967 and moved into 135 Ashton Road around 1974 – it was the ex “Viewhome”. A lot different to our terrace house in Beaconsfield Road, Norton. Happy days all round living and working on the Glebe. That’s the same man Alan & he still lives on the Glebe Estate, not a bad advert you guys living in the properties you built. Johns been a keen golfer in his time at the Billingham Club. Another memory of my dad Raymond Galley was when Fordy’s were building Teesside High School at Egglescliffe and my step- mother was surprised to find him having a lie down in bed one afternoon when she came home from work. He reluctantly admitted that he’d fallen off the roof earlier that day and had felt a bit funny so had driven himself home to have a bit of a lie down! I don’t know whether he even mentioned it to anyone else, don’t suppose he put it in the accident book! I think he just went back to work as normal the next day. What a guy! Does anyone know any history of Fordy builders, when and where they started etc? My partners grandfather (Emmanuel Ridley) was supposed to be the first brick layer employed by this company. Ray Galley was my step father and I can tell you I never thought of him as terrifying but as a guy who was a total professional, loyal, hard working, stubborn and reliable. I could put more positive comments but I would only embarrass two wonderful step sisters, Kaye and Lindsay who have posted comments here already. The Glebe was where, with Ray”s guidance, I bought my first house. I was the first owner but I”m ashamed to say I cant recall the address. I had a wonderful neighbour called Mrs Oliver who moved to the Glebe just before I did. She knew more about George Fordy than either Malcolm Fordy or Ray ever did. My lips are sealed! The house was top quality and I believe much of the design on plot layout and style was down to Ray. I stayed there for about 3 years before moving to Darlington. Ray Galley”s long service to Fordy & Sons was something to respect in a time where long service often means 3 years. He was a true professional, who was the last of a generation who stayed to work in the town where they were born. I can remember him returning one evening late after having been “accidentally” locked in the toilet. He said he had to climb out of the door or window but it made him laugh nonetheless. At his retirement dinner I was surprised to discover that my own grandfather”s timber importing company in Hartlepool, T E Robsons & Co, and my maternal grandfather”s building company, Harland & Parker, both long since finished, had connections with Fordy”s building contracts in their day. I have great memories of Ray and happy memories of a short time on the Glebe. After reading the comments by both of Ray Galley”s daughters I realise that he wasn”t really terrifying, just a firm disciplinarian. Even in the fifties there were some in the class who were a bit of a nuisance and just there to avoid premature call-up. ( We were deferred until twenty-one to complete our apprenticeships then the dreaded military machine could have us!) Ray was a good lecturer who taught me a lot about the application of science to building construction. Even though he was quite oblivious to the fact that he embarrased us totally by informing the group that we were his “star” pupils. Thanks ladies for your comments ,I enjoyed reading them. My Dad , Ray Galley, became less terrifying as he grew older as his grandchildren would confirm but he remained a strong character throughout his life which sadly ended in July 2004. As a child I have vivid memories of him returning from work on the sites and washing his hair in the sink with Daz to remove the day`s collection of dirt and cement. It is true he was a hands on “executive” and my step- mother often despaired at the state of his suits at the end of a working day. Some other sites I remember visiting on our Saturday morning tours were Norton Fire Station and Rembrandt clothes factory. I was one of the “Early Settlers” in Rimswell Road. The houses were well built and we were very satisfied with ours. However, in 1965, after four years in residence, we packed our bags and hammocks and boarded the Aircraft for Australia. After the initial bout of “Homesickness” and the “What have I done”, we settled down and have never regretted a day of our life in Oz. Five years ago I took a sentimental trip around the Rimswell Estate and it looked as though; unlike so many other estates, it had actually improved with age. I can remember the Fordy”s. I drove the old man home a few times when I was working as a part-time taxi driver for Rea”s He gave me a whole 3d as a tip I did well as some got nothing. We were one of the first to buy one of their homes in Fairwell Rd aptly named, 1 year later we were on the S S Oriana bound for Australia, a move I have never regretted. For one or two years Fordy employees did receive a chicken from the company at Christmas, I seem to remember in a previous year we were gifted a hamper. I walked home most days from the Glebe estate to my home in Fairfield, that hamper proved quite a weight to carry such a distance. I think both the chickens and the hampers were given only to employees who had been with the company for a certain length of time, plus having to hold a good timekeeping record. I seem to remember that one year, while working on the Glebe, we were each given a chicken as part of the Christmas bonus. This would have been in 1974 or 1975. Could someone please confirm this. Lindsay Galley, it”s nice to see your comments on this site. I wonder if you could add a picture of your father. A lot of people remember him. I remember Ray Galley very well too; he was my Dad! You are quite right, he was quite terrifying and I take after him so watch what you say from now on. He used to take my sister and I on site visits on Saturday mornings after our Mum died. We were frequent visitors to the Horse and Jockey on Durham Road, Norton Fire Station, Fairfield Secondary Modern School swimming baths, St Bede”s school and the offices in Boathouse Lane where we were allowed to play on the telephones. We always called at Durham Road Fisheries for fish and chips on the way home. I remember Glebe with bungalows starting from £2,500. Incidentally he spoke very well of Jerry who lived on Windermere Road. His house was “a palace”. Oh, and Mal, wherever you are, I still have your shovel! Ray Galley was one of the company directors with George Fordy & Son, this was a fact difficult to believe watching him on site. As already mentioned by Alan Wealleans you would find Ray digging out trenches mainly for the drainlayers. Somedays he could be found hard at work long before the 8am start for the site workers. Jimmy Carter and Arthur Bullus were two of the men who he would often work alongside. In my own dealings with Ray I always found him to be a rather quiet and withdrawn man. Steve Keily mentioned Wally and Wilf, carpenters who worked for Fordy”s. I knew them both very well, working with them on both Glebe and Rimswell estates. I think they were possibly the most well known of Fordy”s workforce. They were certainly No.1 with Ray Galley also managing director Malcolm Fordy and his father before George. With further reference to Ray Galley I think he sadly died 2/3 years ago. I remember Ray Galley well and he did not say much at all to anybody. Site foreman was Bob Bashford, Brian King and John ? (tall canadian I think). Yes Wilf and Wally where there when I worked on the site. Also carpenters Jimmy? and John Mathie, Tommy Thompson and Denis Umpleby, then old Peter and Wilf. Peter had a bike he always rode around on and carried his tool bag with. Painters, Bert and Les, John Robson and Robbie Wilkinson, Alan ?. Plumbers, Peter and Alan. Electricians, Alan Davis, Tommy Gillies, Phil Kennedy, John Manton, Apprentice Electricians Martin Eden, ? Carroll, Martin Wood. Yes very good site for mates even though the money was not so good. I remember Mr Galley very well. On my first day of work as an apprentice carpenter/joiner he took me from Boathouse Lane [Head Office] to the Glebe Estate in his Range Rover. I always remember being afraid of the man and I have no idea why because he can”t have spoken to me more than three or four times in as many years. The famous faces at the time were carpenters Wilf and Wally and two paviours whose names I simply don”t remember. The guy who taught me all I know about the trade was Charlie Whittingham [forgive spelling] He was completely deaf but always knew when I had the radio on too loud. For young people reading this I”m talking about the period from 1974-1978. This is a time before carpenters used electric tools on site and the take-home pay for a first year apprentice in 1974 was about 15 pounds a week. Perhaps Alan and John came across a Mr Galley on the Fordy site? He was a part time lecturer at the Tech around 1956-1960 time. He took the class I was in for Building Science and was looked upon as a bit odd. ( Sorry Mr G if you are reading this) Apparently he would get bored with his normal site duties and take over the trench digging with a DROTT small excavator. As a result he was given the title of the most highly paid Drott driver in the land! He subjected a friend called Alan Bridson and I to much embarrassment by stating to the whole group that we were his star pupils. I could have strangled him! I worked on two of the housing sites built by George Fordy & Son, Rimswell and Glebe estates. “Noddy” who Alan Davis refers was a labourer/scaffolder on both those sites. In all the years I knew him he was always called by the nickname “Noddy”, his surname was in fact Noddings I cannot remember his first name. There were days on site when he probably could not remember it himself, he frequently enjoyed a liquid lunch. It was good policy to stay clear of him at such a time, especially when he had a scaffolding key in his hand. This photograph shows Ashton Road on Glebe Estate Norton in 1983, I remember this time well as it was taken just before we emigrated to Australia. I worked on this housing project (Glebe) in the late 1960″s up until about 1973. The site was then a FORDY site and run by Malcolm Fordy. It was a great place to work and was where I learned the trade of electrician, the housing part anyway. Names such as John Robson, Dennis Umpleby, John Mathie, Philip Kennedy, John Manton spring to mind as well as “Noddy” the scaffolder – now he was a character – does anybody know his real name.